When I was moved from first grade to fourth grade this year, someone said, "Well, no more fun stuff for you!" All those fun games and crafts that we do in first grade replaced by study guides and test taking skills and note taking. Ugg. So, I decided early on that I could not survive that kind of boredom and I did not want to have that kind of classroom. I packed up all the paints and brushes and glitter and moved them to fourth grade! And you know what I discovered? It is SO MUCH EASIER to use paint and glitter with fourth graders! They can follow directions and not make a gigantic mess! Then they clean everything up all by themselves at the end. It's amazingly easy! 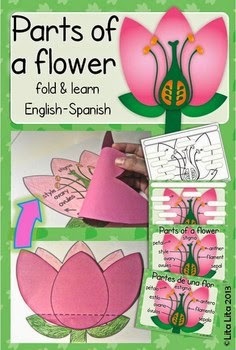 I used the Parts of A Flower Fold and Learn from Lita Lita. After we labeled the flower parts and put them all together, we added pollen (glitter) to the anthers. We noticed how the glitter got on our hands and we transferred it to our desks and faces and chairs and everywhere. We were pollinators! We pollinated all the flowers and learned the parts of the flower in the process. Tomorrow - fractions and paper plates and stickers! Good for you! Keep the creativity alive in students!